Hi! My name is Snow. I’m Dr. Sarah’s Therapy Dog. I’m in all her sessions whenever clients want me to be. They can cuddle and hug me or just let me lie by their side or at their feet like a good dog will. Her young clients might like to play with me too. Officially speaking, as a therapy dog I don’t do what’s called a service dog does. They are trained to do particular tasks for their individual ill or disabled owners. Nor am I trained to help Dr. Sarah carry out particular interventions with her clients. We therapy dogs are thoroughly and carefully selected and trained simply to safely and politely bring the natural affection and comfort a loving pet provides at home into settings like doctor’s offices, clinics, hospitals, retirement homes, nursing homes, colleges campuses, hospices, or disaster areas. UCLA Program Director Jack Barron is convinced therapy dogs are effective. “We’ve had so many outcomes,” he says, “all good.” He describes his crew as “a smorgasbord of wonderful dogs” — from four Great Pyrenees, about 100 pounds each, to a 2.5-pound long-haired Chihuahua. I’m a Maltipoo. That means my mother was a Poodle and my father was a Maltese. 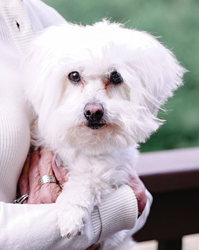 It is said that we Maltipoos are the “gems” of hybrid companion dogs. I weigh about nine pounds and I have hair, not fur, so I’m hypoallergenic. People who have allergies to most dogs don’t have to worry about me. Sarah’s patients say my hair feels very soft like a feathery, white boa. I’m a very happy working dog. I’m there to help. PS. Here’s something else interesting I learned about having me around in What Dogs Can Teach Us About Receiving Love . Giving and receiving love is just in my nature I guess. I love people and I love for them to love me too. You can learn about other ways I can help you. See my other articles, such as this one on Pet Bereavement. This hotline is sponsored by the American Society for the Prevention of Cruelty to Animals (ASPCA) and it is the first number you should call if your dog ingests or comes into contact with a dangerous or poisonous substance. This 24-hour service gives you the option to have a consultation with a veterinarian for $65. The Pet Poison Helpline is another option to call if your dog ingests or comes into contact with a dangerous or poisonous substance. This service only costs $35 for residents of the U.S., Canada and the Caribbean, which includes an initial consultation and any follow-up calls. This hotline is run by the Lyme Disease Foundation, a non-profit organization that is devoted to finding solutions for tick-borne diseases like Lyme disease. This is the hotline to call if you have questions about tick-borne diseases like Lyme disease, Rocky Mountain spotted fever, or Colorado tick fever. The Stolen Pet Hotline is the number to call if you think that your pet has been stolen. When a dog disappears, it can be a traumatic experience and you do not want to think that someone may have taken your pet. This hotline exists to offer assistance if you think your dog has been stolen. This is the number to call with all of your questions about flying with your pet. Counsellors can help to answer your questions about airline regulations and about what you should bring when traveling with your pet. Do you need help finding a low-cost spay/neuter clinic in your area? The Spay/USAHelpline will point you in the right direction. This helpline is run by an organization whose mission is to reduce over population of pets by ensuring affordability of spay/neuter services for all pet parents. Counselors are available Monday throughFriday from 9am to 4pm EST. This hotline is available for pet parents who pet has passed away or is suffering from a terminal illness. You can call this hotline for help making the decision to euthanize your pet or for advice on how to explain the loss to your children. Counselors can also provide help with establishing a good relationship with your new pet. Get in touch with qualified animal behavior specialists who can help to answer your questions about all kinds of pet behaviors. If your pet is exhibiting problem behaviors or if he suffers from separation anxiety, this is the number to call. You never know when the unexpected might happen. From illnesses and sickness to behavioral issues, our dogs always keep us on our toes, and you want to be prepared.Bookmark this page, print off this list, stick it on the refrigerator or keep it by the phone,and pass it along to other pet parents – we all need an expert opinion for any unfortunate situation that arises.